Starts in black and white at a Kansas fair in 1905. James Franco plays a fairground trickster who doesn’t want the responsibility of marriage to Rachel Weisz. His magic is fraudulent. He escapes from aggrieved colleagues in a balloon in which he gets into a tornado and ends up in Oz. He meets two witches (Mila Kunis and Rachel Weisz) and a winged monkey. Later he rescues a porcelain girl. He must prove himself to the Munchkins and the citizens of Oz against the wicked witches…. If MGM has the rights to the Tin Man, the Lion, and the Scarecrow, how come this film can show the Munchkins which MGM presumably has the copyright on? Oz the Great and Powerful takes full advantage of its seventy five years of cinema technology over the Selznick film, so I suppose it’s unfair to compare them as spectacle. This Emerald City is a green version of the red palaces of Tim Burton’s Alice. It’s of course much superior to the painted cardboard of 1939 which was magical enough in the world of depression and impending war. The new film is a highly efficient CGI extravaganza but cannot claim the earlier film’s magic. We are too consumerist and sated, “less is more” is not a respected precept in today’s cinema. The scene at the funfair in black and white is a throwback to the opening scenes of the Garland film, but that was the contrast of reality to dream whereas in this film it feels like it’s from gimmick to gimmick. The only new character we get is a china doll and with this ‘Shrek-like’ midget we romp through the latest computer tricks with no human depth. James Franco’s fairground magician reprises Heath Ledger’s role in Imaginarium, the film works like a Terry Gilliam project as we get reminders of that film. 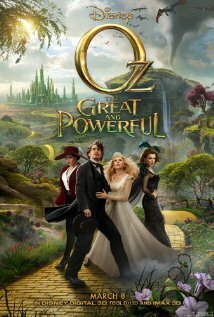 Oz The Great and Powerful share the same limitations as other productions of the L Frank Baum stories in that the characters may look weird and a bit threatening but they lack the violence and terror (for children) of the books. The Munchkins, the doll, and the monkey are all reduced to the lowest common denominator of bland amenability and acceptable character changes through predictable plot developments. The bad guys look like cereal packet monsters and the good guys are the usual contenders for the Prom Queen’s favours. In the end, love and sincerity must prevail over deceit of self and others, a conventional message of hope. Sometimes fun but could have been more imaginative.. The prequel to the 1968 film Planet of the Apes. James Franco plays a scientist working in a lab using apes to test drugs. One chimp displays unusual intelligence and it goes berserk trying to protect its child. The chimps in the lab are put down. Franco rescues the baby chimp which grows up to show high intelligence, he calls it Caesar. Franco’s dad, John Lithgow, suffers from Alzheimer’s disease and Franco uses the lab drug on his dad, with amazing results. Then Lithgow returns to his Alzheimer’s disease and he causes chaos in the neighbourhood and a young neighbour is attacked by the young chimp, Caesar. Franco must send Caesar to a primate centre where he is mistreated by a bullying keeper. Caesar turns on his tormentor and leads the other apes out of the centre into a pitched battle with the police on the Golden Gate Bridge. The drugs Franco used are fatal to humans but apes are immune. Caesar can speak. We’ve had lots of films about apes and monkeys. This presumably stems from our supposed close relationship with them (denied by some scientists). In the 30s with Tarzan and King Kong we showed a sort of benevolent paternalism to them. In the era of Greenpeace values, apes have done well, becoming heroes of the uncorrupted wilderness from Greystoke and Gorillas in the Mist to Instinct. Naturally, people come off worse, apes are hairy noble savages protecting their Eden of primitive innocence. Jane Goodall and other naturalists have tried to habituate us to our natural closeness to the apes which I’m not convinced by. I’m sceptical about macro-evolution and incline towards some sort of Intelligent Design, but I’m not religious. These films are sentimental Darwinist fantasies, yet chimpanzees are dangerous and savage and they will attack us. They can also use bones as tools, not needing to touch the black momolith which in 2001 set hominids on their tool-using way to become human. Rise of the Planet of the Apes is disappointing compared with the 1968 film, though it’s better than the TV series and the awful Tim Burton remake. Rise Of is too much like a summer blockbuster with the appropriate simple sentiments that manipulate us into hating ourselves and cheering on the apes (Instinct and Gorillas in the Mist also did this). James Franco naturally has a cute girlfriend who of course is on the right side, which is the cause of the ape. There are the exceptions, we are meant to think that the planet would be better off without human hegemony. The corporate businessman who runs the lab is of course on the wrong side, as are the vile zookeepers and aggressive neighbours. When Caesar is in the primate centre we get the stereotypes of prison movies: mistreatment of inmates and the gang that fights back. In this film Andy Serkis models for the computerized effects, and this is just as anthropocentric as the 1968 film’s use of plastic masks. At least the ’68 film could make its satirical point better in its pantomime outfits by exposing the self serving brutality of humans against other animals. The snarling revenge of the apes in Rise of the Planet of the Apes undermines the ’68 film’s effectiveness as a parable since it is merely payback. Chimps are not sympathetic candidates for good relations with nature. In Rise of the Planet of the Apes human traits are superimposed on ape faces, usually a hateful glare, whereas in other films it’s an embarrassing sentimentality. Set in the mid 1950s about Alan Ginsberg the poet and the ‘obscenity’ trial at which his publisher Ferlinghetti was present but Ginsberg was absent. We see Ginsberg trying to write and then read from his poem Howl to an audience of enthusiasts, some of whom may not have escaped being called ‘beatniks’. We see Ginsberg’s relationships with Neal Cassady and Jack Kerouac. We learn that Ginsberg did not want his father to learn that he was gay. We see him interviewed by an unseen and unheard interviewer as he expands his notions of what poetry is, and what the artist’s relation to it should be. We see animations expressing the poems. We see the courtroom drama where Jake Ehrlich (Jon Hamm) defends artistic freedom and Ralph McIntosh (David Strathairn) attacks it. We see artistic freedom vindicated after Ehrlich and McIntosh question several academics about art. Jeff Davids plays one of the academics. James Franco plays Ginsberg. It’s amazing how the beats actually started out as aspirational middle class. Throughout the film, Franco as Ginsberg is dressed soberly, his only wildman concession at the end is a neatly trimmed beard. Indeed, Ginsberg denied the charge of being ‘beat’, he says it was a group of guys who wanted to get published. Ginsberg in the interviews is much concerned with the relationship of the writer’s life to the work, in that he shares our mania for often irrelevant biographical details. Franco always makes him likeable and makes you realize that there was an urgent organic need to question the America of Revolutionary Road and Stepford Wives. Howl commendably shuns the temptation to mythologize its hero and this puts the career of Ginsbergs’ most famous admirer, Dylan, into an interesting perspective. Ginsberg remained accessible and he was close to his audience who must have felt like they were in a feisty verbal brawl. There was none of the distance that fame and money inflicted on Dylan’s fans. I could appreciate the tangible details in Ginsberg’s poems though when he preaches, his poetry sounds like a precocious but naive fifth former trying to impress. He is fascinating for me on the street imagery in The machinery of night. He was also quite bravely gay in an era when it could destroy lives. Dylan on the other hand lends himself too easily to the bogus mythologizing of I’m not There, the recent biopic which use different oddball personae. It’s interesting that Howl uses Dylan’s Wheels on Fire for the end credits, you would think something from his earlier work would be closer to the beat spirit, but of course it isn’t. The 1962-66 period of ‘beat’ Dylan is derivative folksy ballads leading to ’64-66’s whiney voice winding through capriciously collaged snapshots of imagery. Franco reads Ginsberg’s work like he’s an urgent shaman of the coffee bars.